Data Structures And Algorithms Made Easy In Java is a comprehensive and wide-ranging guide on data structures. – Imported Edition Summary Of The Book Data Structures And Algorithms Made Easy In Java is a guide which helps you understand data structures better. Data structures are ways in which data is stored and organised on a computer so as to make it more resourceful. There are different kinds of data structures available for different tasks, with some being highly specific and others used for certain applications. They help in effectively managing large quantities of data with the help of algorithms which, in the fields of mathematics and computer science, is a systematic procedure towards solving any numerical problem. The book covers many topics concerning competitive examinations and includes numerous puzzles and probable interview questions to help the reader prepare better. Each question also comes with multiple solutions of varying complexities so as to enable the reader to deal with a variety of questions. Furthermore, all codes in the book have been written using the Java script. It is a complete preparation guide for likely job aspirants for companies like Oracle, Microsoft, Amazon, Facebook and for people appearing for competitive examinations. Data Structures And Algorithms Made Easy In Java has a comprehensive introduction and various informative chapters such as Linked Lists, Stacks, Queues, Sorting, Searching, Symbol Tables, Dynamic Programming, Complexity Classes and Miscellaneous Concepts. Salient Features of Book All code written in Java Data structure puzzles to improve thinking Enumeration of possible solutions for each problem Covers all topics for competitive exams Covers interview questions on data structures and algorithms Reference Manual for working people Campus Preparation Degree/Masters Course Preparation Big Job Hunters: Microsoft, Google, Amazon, Yahoo, Oracle, Facebook & many more. About the Author Narasimha Karumanchi is the author of many popular books on data structures and algorithms and a software developer. Some of his books are Data Structures and Algorithms Made Easy: 700 Data Structure and Algorithmic Puzzles, Data Structures and Algorithms For GATE: Solutions To All previous GATE Questions Since 1991, Peeling Design Patterns and Coding Interview Questions. Karumanchi was born in Kambhampadu, Guntur, Andhra Pradesh. He graduated with a B.Tech. degree in computer science from JNT University and with an M.Tech. degree in the same discipline from IIT Bombay. He has previously worked with IBM Labs, Hyderabad, Mentor Graphics and Microsoft. He is presently working as a senior software developer at Amazon Corporation, India. He is the founder of CareerMonk and also designs algorithms for Stockmonks.com. Karumanchi has also taught at many training centres and colleges. Narasimha Karumanchi is the Senior Software Developer at Amazon Corporation, India. Most recently he worked for IBM Labs, Hyderabad and prior to that he served for Mentor Graphics and Microsoft, Hyderabad. He received his B-TECH. in Computer Science from JNT University and his M-Tech. in Computer Science from IIT Bombay. He has experience in teaching data structures and algorithms at various training centers and colleges. He was born and bought up in Kambhampadu, Macherla (Palnadu), Guntur, Andhra Pradesh. 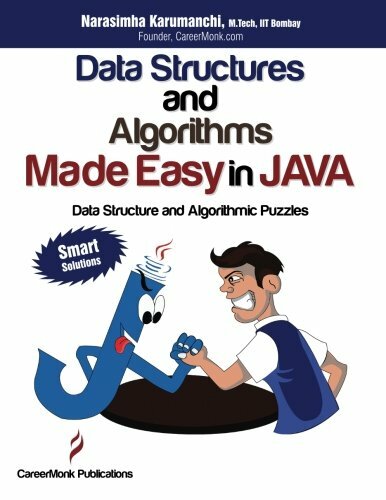 Buy the book Data Structures and Algorithms Made Easy in Java: Data Structure and Algorithmic Puzzles from Ideakart.com.